One of the key strategies for successful financial independence is to keep right portfolio allocation and diversification. What I have decided is my annual investment targets to be invested in mutual funds. This will provide less growth but less risk as well. Should I manage to accumulate any additional money for the investment, I can put them in individual equities, if I want to. From A to B and how. B - Where you want to be (amount of money you need to achieve financial independence). How – Family budgeting vs. Income –Savings and where to invest. - Absolute total return on invested cash. Expressed in dollars and percentage. In 2012 the result was $5,4 K and 3%. 3% vs. 14% (S&P 500). 2012 inflation was 3%, hence adjusted return was 0%. 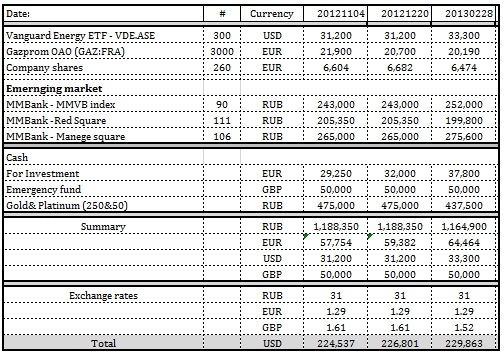 - Cash accumulated to be invested (annual figure expressed in 2010 money). $ 51 K vs. $ 40K planned. - Assets & currency allocation. To be developed. Moving in the right direction. After getting acquainted with inflation, I lowered my expectation of early retirement /financial independence. However this is still a very important indicator. Suppose market performed well, but you did not manage to accumulate as much money as planned – you still on target. Sometimes market was bearish or certain assets underperformed, but accumulated cash compensated for it. You need to have your own understanding and aspirations.